Plastic dog tags by Red Dingo in the shape of a bone, heart, disc or rectangle. 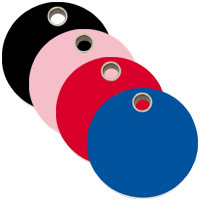 Plastic tags are a great idea for a light weight dog tag that is durable, will retain it's engraving instead of wearing down and will not rust, corrode or become illegible over time. An engraving service is included at no extra cost which is guaranteed for the life of the tag.